CESD works with the Union, State and Regional governments of Myanmar, multilateral institutions and other stakeholders, to conduct research on a range of economic, development and social issues, and to advocate for public policy changes. 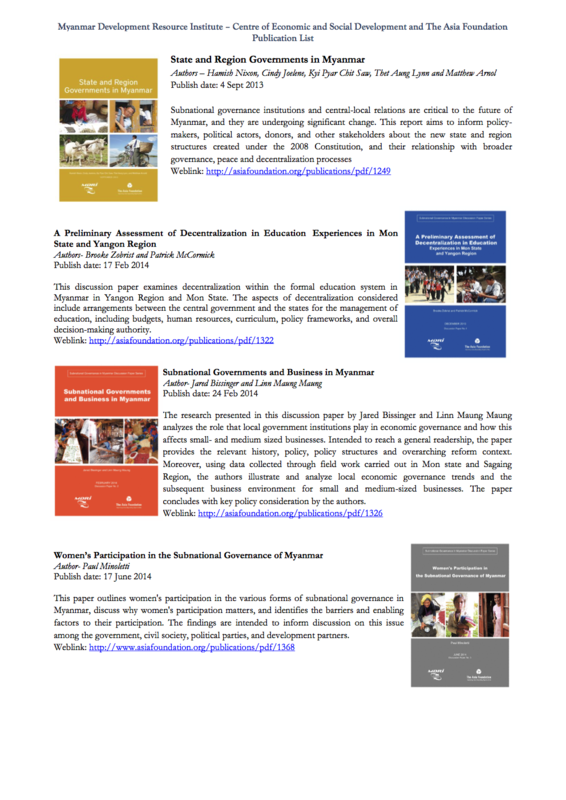 CESD has published a number of papers, briefs, and policy recommendations on a myriad of topics including decentralization, Myanmar’s minimum wage, aquaculture development, and state and regional governments, as well as other topics significant to Myanmar. In 2012, CESD played a central role in the development of the Framework for Social and Economic Reform (FESR) (PDF, 46 pages, 662Kb), which was adopted by the Government of Myanmar in December 2012. This strategic policy framework served as a guide to economic and social reform across different industries and government initiatives during 2012-2015. Since its establishment in late 2012, CESD has played a significant role in supporting political, economic and social reform in Myanmar. CESD was also the coordinating body for the Leading Authority of the Myanmar Extractive Industries Transparency Initiative (MEITI).